New "Says You!" Tapings in Seattle This Weekend! 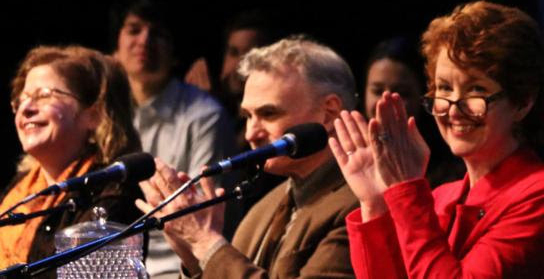 I’ll be in Seattle for the live tapings of the NPR radio quiz/comedy show “Says You!” this Friday 4/5 and Saturday 4/6. Shows are at the University of Washington’s Kane Hall at 7:30 p.m. Tickets and more info available here. SO MUCH FUN to banter and play with such an esteemed gaggle (cluster? murder? pride? hmmm) of smart and witty folks such as Tony Award winner Murray Horwitz, culture critic Carolyn Faye Fox, and Erin McKean, founder of online dictionary Wordnik.com. All hosted by the inimitable (though we will certainly attempt an imitation or two) Gregg Porter, the Seattle radio superstar. I’ll post the air dates of the shows later, in case you can’t be there in person! Either I’m applauding ourselves or measuring a small invisible animal.